Want time to laze, walk and learn a little about Turkey? This is the perfect option for you! We offer a 7 night tour staying in either budget or classic accommodation incorporating time to relax, rejuvenate, take part in guided walks conducted at a leisurely pace and learn a little about Turkish cuisine, wine, history and culture. 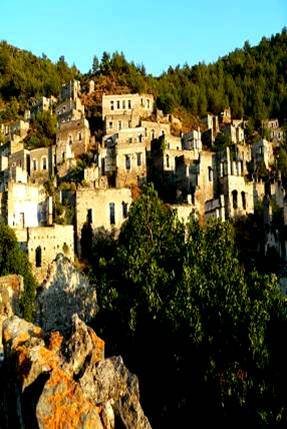 You stay in Kayakoy, an abandoned former Greek town now nicknamed ‘the ghost town’ following a forced population exchange in 1923. It’s a fascinating village a far cry form your average commercial resort. Around 2000 deserted stone houses are nestled into the valley, a handful now converted into traditional pensions, hotels and BBQ houses or traditional organic restaurants. The valley is breathtaking, Babadag (literally translated as Daddy Mountain) towers above the sleepy valley at a colossal 6800ft. You walk down the maze of country tracks and lanes to discover the old Turkish woman tending her goats, the wild tortoises lazily crossing the road or the man trying to give you fresh fruit from his garden. It really is a true taste of old village life yet offers those that like a few evening options a nice mix of traditional village restaurants, fascinating local wine houses or gozleme (traditional Turkish pancake) cafes to choose from. PRICES SHOWN ARE IN POUNDS BASED ON A WEEKS BASIS INCLUDING ALL GUIDED WALKS, TRIPS, TOURS AND MEALS AS STATED. ALL BREAKFASTS, LUNCHES ON 5 DAYS AND 4 MAIN MEALS INCLUDED. SINGLE SUPPLEMENT 70%. THIS IS AN ADULT ONLY WEEK (18+). WALKS ARE GRADED ACCORDING TO THE BRITISH RAMBLERS ASSOCIATION, E IS EASY, B IS VERY HARD TERRAIN. The group gets together and is met by our representative and our Turkish/English speaking guide. We get to know one another over a welcome drink and traditional meal (please let us know of any dietary requirements prior to arrival). We browse the weeks itinerary, make any amendments necessary, give you a local map of the ruins and answer any questions you may have. Following a traditional Turkish breakfast, we meet at the foot of the Kayaköy ruins. Our guide then takes you on a moderate walk up the cobbled old village pathways allowing you an insight into the history of the ‘ghost town’. You have time to explore the ruins before taking a delicious picnic lunch of traditional ‘meze’ (vegetables with olive oil), ‘borek’ (meat or cheese pastries) and sandwiches on the hillside enjoying superb views of the coastline beyond. 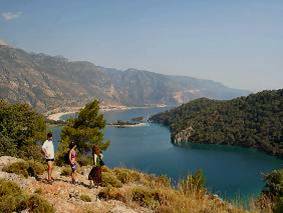 The afternoon sees us take a coastal walk down to the famous Blue Lagoon of Olu Deniz. Olu Deniz has seen rapid growth over the past few years. Formally a small beach destination popular with backpackers and paragliders, its stunning location and beach is now home to many hotels, all-inclusive resorts, cafes, bars and clubs. Although decidedly commercial we still think it is a place worth seeing, it’s lagoon is now the signature image of coastal turkey and the resort still has a certain charm that brings visitors back year on year. Paragliders adorn the sky taking those brave enough on a flight from Babadag mountain to the beach and microlights soar above allowing spectacular views of the coastline, Kayakoy, the lagoon and Butterfly Valley. We have time to shop or laze on the sand before returning just before sunset to our accommodation. Your evening is spent at leisure in Kayakoy. Optional Activities: If you wish to see Olu Deniz from the sky paragliding or microlighting can be organised in advance at an extra cost. Please book prior to arrival. We only use reputable and insured local agents. Paragliding costs 70 pounds, microlighting 58 pounds. Both are subject to weather conditions. DAY 3 Taste Of Turkey Day. Cookery and Wine Tasting. We meet after breakfast and leave early for the old harbour town of Fethiye. We have a little time to explore and shop before meeting up and visiting the local fish, vegetable and spice markets to buy the fresh ingredients for the evenings supper. We then return to the hotel via the Old Wine House for a traditional meze lunch and where we can taste and learn about Turkish wines and even buy some should we fancy. The Kaya Wine House is fantastic and truly unique. It’s a old converted stone chapel at the back of the Kayakoy valley surrounded by farmland and olive groves. The lovely Arzu and Nevgun take you to their well stocked cellar where you can taste all manner of popular, organic and village wines. Red, white or fruit – whatever you fancy is sold here and the girls are happy to explain the wines history and varieties – they even know the growers should you wish to order more! We then move on to our hotel to get a lesson in traditional Turkish cookery. Taught by one of our fabulous chefs you see how to make a selection of mezes starters and a main course. Having prepared them its then time to relax until the best bit – eating the food you learned to cook that night! Today our walking guide, Ali Ishan takes you on a moderate walk to the infrequently visited ruins of Afkule Monastery in the cliffs above the Mediterranean. Here we can appreciate the peaceful seclusion and amazing views experienced by the former resident monk. The walk is a little challenging in places so good walking boots are required. Ali has lived and worked in the region for many years and is a fascinating man very passionate and knowledgeable about the flora and fauna, the wildlife, local history and the surroundings. As he walks he points out indigenous aromatic plants such as seasonal thyme, oregano and sage and alerts us to the local birds, wild tortoises, birds of prey and insects. We take a peaceful walk down through the coastal pine forest to Darbogaz Beach where we have a light lunch (maybe fish from the local fishermen is possible) looking out on the spectacular views. We then get taken by the fishing boat to Gemiler Beach to meet our transport back to the hotel. The evening is spent together at a local restaurant in Kayakoy. Today is a truly fabulous day and the highlight of the week to many. We leave for Fethiye marina after breakfast to meet a local boat for a day of swimming, sunbathing and relaxation aboard a traditional gullet or ketch. There really are no words to aptly describe the beauty of the regions coastline and no better way to see the clear turquoise waters and secluded bays than by boat. The boat is traditional and wooden in style with big sun lounging areas and a nice mix of sun and shade to the front and rear. The staff are friendly and at hand to bring you drinks throughout the trip (costs apply). There are many beautiful bays and islands around Fethiye so we allow the Captain to sail his own itinerary, his only instruction is to steer clear of bays that may be busy with noisy daily tours allowing you to potter along the coast and appreciate the views in peace. We stop for swimming and snorkelling and around 1pm we sit down to a lunch of fresh meze, chicken or fish and fruit (the main course should be pre ordered). The afternoon is spent lazily cruising and stopping before returning to meet our transport in Fethiye at around 5pm. We return to our accommodation for an evening spent at leisure. Following the lazy day previously we think some exercise is in order so we today go for a hike of around 5 hours from the beautiful mountain village of Uzumlu to the rarely visited ancient site of Cadianda. This walk is of medium difficulty and includes some stone inclines so sturdy walking boots are a must. Ali starts us near an old plane tree where we observe the bird life and indigenous plants around us. We follow an old stone trail upwards to the pine forest where we see our first Lycian tombs. This area is steeped in history, Hectors Tomb is a great example cut from rock with fine carvings and relief's. We walk on again through the ancient Roman walls of Cadianda taking in the panoramic views of the valley as we go. We walk up to the ancient water cisterns and on to the Stadium where we sit down for our picnic lunch. We hear a little about the history before making our way steadily back towards Uzumlu passing the Theatre, the Necropolis, Stoa and Agora as we trek down a rather steep decline. Once back in Uzumlu we have a little time to explore, take a quick drink, buy some of the fantastic local handmade silk or textiles before getting our transport back home. Your evening is spent at leisure. We leave the last day down to you. A laze by the pool, a walk through Kayakoy, a dolmus (bus) ride to Gemiler, Olu Deniz or Fethiye or an excursion, its entirely your decision (our representative will have gone through and arranged any additional excursions you may wish to take today during your welcome meeting). The evening sees us all get together for farewell BBQ, a feast of Turkish cuisine and a glass of local wine. After a leisurely breakfast there is time for a swim or last minute stroll before departing for your second weeks accommodation, gullet cruise or return flight.